If you had to pick some of the most common things you do on a web page, clicking on links to navigate between pages should be at the top of your list. You probably don't even realize how frequently you click on things to go to a different page. In fact, you probably clicked on a link to get to this very page! And with that, let's get started! Once you have copied and pasted the above HTML and CSS, go ahead and preview it in your browser to make sure everything works well. Now that you have a working example, before moving on to the next step, let me point out some interesting tidbits from the HTML that you will find relevant for future sections. Our buttons are, shockingly, of type button. I won't go into too much details of the button element here, but the main thing to note is the id value of each button. The Yes button has an id of yesButton. The No button has an id of noButton. When we start adding some code, you will see these id values being used. Inside this script tag, we are going to listen for three events and add three event handlers that correspond to those events. We define the setupEvents event handler which will get called when the DOMContentLoaded event is fired. You can learn more about this event and why we use it by reading the Running Scripts at the "Right" Time tutorial. Depending on which button you click, the appropriate event handler will get called. When either the Yes or No buttons are clicked, we want to navigate to a different page. Right now, we have everything setup with our events and event handlers except for the code to do the actual page navigation. The moment you set the location property, your browser will navigate you to the page you specified. Once you have added these two lines of code, go ahead and preview your page in your browser. 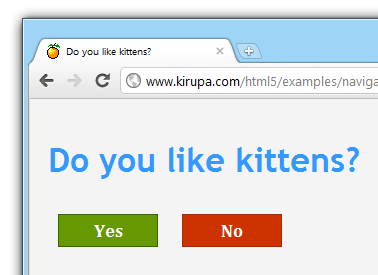 When you click on either the Yes or No button, your browser will navigate to the corresponding page. Yay! Make sure the document has fully loaded. If the document hasn't fully loaded and you run some code against it, things may not work. Make sure that clicking on either button does something. Each button will have its own unique click event that gets fired when you click on it. You need to make sure you have your event handlers setup to react to the click. Navigate to the right URL. Depending on which button's event handler is called, you will need to navigate to the correct page. That's our code, pretty much in a nutshell, explained in English! 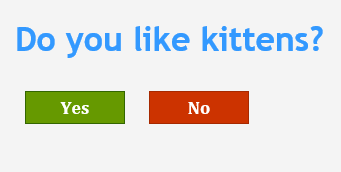 Of coursse, as a distraction, I hope you liked the two websites the Yes and No buttons take you when you click on them. This tutorial took twice as long to write because I couldn't stop browsing through LOLCats.